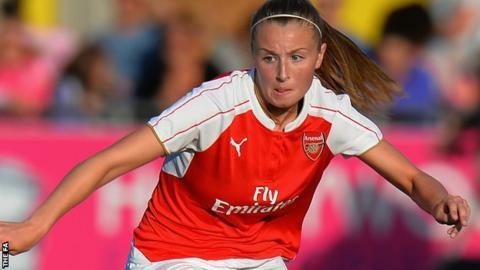 Arsenal Ladies midfielder Leah Williamson says it was an easy decision to commit her future to the club. The 18-year-old, who recently signed a new long-term deal with Arsenal, wants to become an "instrumental" player for the team she has always supported. "I'm delighted because Arsenal is my childhood team. It's my family's team," Williamson told BBC Sport. "We're all Arsenal fans in my family. It's really important to me and to them as well. It's 'our' club, effectively." The England Under-19 international, who was named the PFA Women's Young Player of the Year for 2014-15, has started five of Arsenal's nine league games in WSL 1 so far this season. Leah Williamson has been with Arsenal Ladies since joining the club's Centre of Excellence in 2006, aged nine. She has made 13 appearances for England Under-19s so far, after captaining both the Under-15s and Under-17s. "I know that this is where I want to be. I knew I wanted to commit my future to Arsenal," added Williamson, who signed her first professional deal with the club in March. "Pedro (Martinez Losa) has shown a lot of faith in me. We have regular talks about my development. We both have the same goals for me, and the same vision. "If you're playing football and you don't want to reach the highest level, I think you should question yourself. "I would love to be a regular in the England women's senior team and a regular at Arsenal for years to come. I want to be a key player for them. "Pedro knows that I will work hard and he's willing to put the time in with me, to become an instrumental player in the women's game, and in my team." Arsenal currently lie second in Women's Super League One and host fourth-placed Manchester City on Sunday.